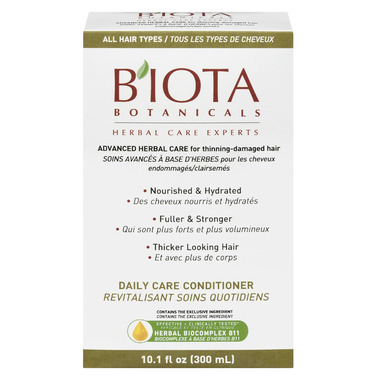 Biota Botanicals Advanced Herbal Care Conditioner was created to help combat thinning and damaged hair. All of BIOTA Botanicals Advanced Herbal Care products contain exclusive, scientifically- formulated Herbal BioComplex B11, a clinically tested combination of herbal extracts with naturally occurring minerals and essential fatty acids that work by nourishing the scalp. Regular and continued use revitalizes the appearance of hair and can dramatically help with thinning and damaged hair, allowing for better nourished, stronger, thicker and fuller looking hair.